The Town Council of Los Gatos has reserved three adjacent prominent spaces in the Town Civic Center located in the center of the Town of Los Gatos for consideration for placement of a Veterans memorial. The Town Civic Center is prominently located on East Main Street between Pageant Avenue and Villa Avenue. Surrounding the Town Civic Center are Town Hall, Town Chambers, the new Town Library, the two Town Adult and Youth Recreation Centers, the Police Dispatch Center, the Town Museum and the Friends of the Library Center. And just a couple of blocks away is the Los Gatos High School campus. Many of the aforementioned buildings were built in the 1950s and 1960s. The one exception to this is the new Los Gatos Town Library, a $12+ million facility that opened its doors in 2012. The spaces on reserve for consideration for memorial placement include the Civic Center Lawn and/or the Civic Center Plaza Square and/or Pageant Grounds. Based on further review with individual Town Council members, we advise artists only to focus on the small area around the Flags on the Center Lawn for design modification. It is the Town’s desire to keep the Central Lawn unobstructed allowing for gatherings on the Lawn and to retain the existing pathway where it is currently located. In addition, individual Town Council members have stressed the Town’s desire to have a bridge connecting the Civic Center Plaza Square and Pageant Grounds. Artists are encouraged to consider this in their designs. Artists, Architects and Designers are requested to structure their designs to consider these spaces, the space specifications and design elements that follow in the creation of their submission. In addition, Artists, Architects and Designers have discretion relative to proposing a design for use of only one of the spaces, or two of the spaces, or all three of the spaces. A description of each of these spaces along with use and design considerations follows. The Civic Center grounds exist on East Main Street between Villa Avenue to the east and Pageant Avenue to the west. To the left (east) of the Civic Center exists Villa Avenue, which serves as the main access road entrance road to the new Town Library and the Town Adult Recreational Center parking lots. The Adult Recreation Center and adjacent parking is located on the left (east side) of Villa Avenue, Library and Library parking lot located on the right (west side) of Villa Avenue. Pageant Avenue, which is located to the right of Civic Center, provides access to small town municipal parking lot containing a couple of rows of parking (east side of the street), entrance to an access road that goes behind Civic Center (east side of street), an automobile dealership and a couple of private residences (west side of street). All perspectives are written from the directional position of one standing on East Main Street in front of the flag poles located in the front center of the Town Lawn. The Lawn grounds consist largely of lawn, pavement, redwood and other trees indigenous to California, all of which have been numbered and logged by the Town arborist, some of which are lit at night, three artistic structures and rose gardens. The area of consideration on the Lawn is centered around three 45′ to 50′ flag poles at its northern front center just a few feet off of East Main Street, from which hang three flags – American, state of California and Town Los Gatos flags. Other upright structures include three art structures: one titled “Eolian” by sculptor Eric Ziemelis created in 1991 which uses concrete and metal and is located on the east side of the lawn. A second structure, titled Portals and Passages, is created by sculptor Marilyn Kukeht, also made of metal and steel is located on the west side of the lawn. A third art element resembling the base of a tree made of wood and concrete, dedicated to George and Ruth Barati for their contribution to the community and the arts, erected in 1998, is located in front of the Friends of the Library and Los Gatos Museums brick building located on the western side of the lawn in an ivy garden. An arched macadam pathway exists from two exterior perimeter points along East Main Street’s sidewalk emanating from the northwest and northeast of the lawn that leads to the stairway entrance to the front of the Plaza. In addition, a sidewalk exists from the Town Library located to the left (east) of the Town Center and another walkway exists from the right (west) off of Pageant Avenue. We are advised by individual Town Council Members that the location of this pathway is to remain in place. The pathway contains contemporary style lampposts of approximate 15′ in height that were installed in the last couple of years. To the back of the Civic Center Lawn exists (in order of left to right or east to west) a parking area consisting of four rows of parking spaces for the new two-story Town Library which is located behind the parking area (east of center), a public water fountain (east of center), an above ground gas valve and steel utility doors to underground water utilities (east of center), a rose garden and redwood tree dedicated to Rose E. Aldag commemorating her 31 years of public service which sits in front of a handicap access ramp leading to the Plaza Square (east of center), a circular rose garden and 20′ Willow tree that exists between the lawn and the entrance to the Town Chambers (center) which is below the Civic Center Plaza (center), a two-story Town building adjunct to Civic Center Plaza shared by the Friends of the Library and another tenant likely to be but not yet leased to the Los Gatos Town Museums Organization (west of center), an ivy garden with Redwood trees and the aforementioned tree-like art element dedicated to the Barati’s (west of center) and small municipal parking lot with entrance from Pageant Avenue (west of center). An 18″ semi-permanent stage is erected in front of the two story brick Friends of Library/Museum and Administration Building (west of center) and in place from the second week of June to the end of August for summer concerts. The stage is only 18″ in height for the reason that the lower level of the Friends of the Library/Museum/Administration building contains windows that begin at ground level and need to remain partially uncovered for light access to the building. There is some discussion for the construction of a permanent stage for this purpose; however, Town Council has not signed off on that plan as of this time. Use: The Civic Center Lawn is used for concerts and shows e.g. Fiesta de Artes a wine and art show, Fourth of July celebrations and Music in the Park concerts, during the spring, summer and fall. Concerts are heavily attended during the summer and the entire lawn is often packed with audiences stretching from Villa to Pageant Avenues. Concert attendees often lay blankets out on the lawn during summer concerts and suppliers erect booths upon the lawn for concerts and shows. In addition, concession stands are erected in the Recreation Center Parking Lot. For all these reasons this area is very restricted in what can be done. The Plaza is shaped as a square and is built atop the Town Chambers building which, when originally built, had the dual purpose of serving as a bomb shelter. As a result, the Plaza can withstand a great deal of weight. Set back to the left of the Plaza, exists the new Los Gatos Town Library, which hosts a number of specialized rooms. The Children’s Room and Children’s Play Area on the first floor and History Corner on the second floor are closest to the Civic Center and Pageant Grounds. Three two-story buildings have entrances to their second levels from atop the Plaza and are located at three of the four corners of the Plaza Square. The Friends of Library and Museum building exists on the front right (northwest) corner of the Plaza square. Police Dispatch exists on the back right (southwest) corner of the Plaza Square and Town Hall exists on the back left (southeast) corner of Plaza Square. Entrances to the Town Chambers facility, which is located under the Plaza, are beneath ground level and are accessed from stairways located on the front (north) and left (east) sides of the Plaza. Four concrete half moon shaped bench structures are located beyond the perimeter of the fountain approaching the four corners of the Plaza. Large circular concrete planters exist that are sitting within the curve of the bench structures and two smaller concrete planters exist behind two of the four benches, the bench towards the northwest and southeast corners. Other small circular planters exist near the entrances of each of the three buildings, some of which contain foliage and others that are not in use. At the rear (south end) of the Plaza exist two steps leading to a landing. The landing is the width of the space in between the Town Hall brick building located at the back left (southeast) corner of the Plaza square and the Police brick dispatch center located at the back right (southwest) corner of the Plaza square. Individual Town Council Members would like to see a bridge erected to connect the Plaza to Pageant Grounds over the small access road and parking area that exists behind the Civic Center. While there is no final allocation of budget for construction at this time, in reviewing the overall access to these two adjacent areas, artists are encouraged to include the consideration of a bridge tying these two areas together either concurrently or as a future (perhaps second) stage of construction that would be supplemental to the budgetary requirements included in this request. One wooden bench with a brass plate denoting dedication sits in the front left (northeast) corner of the Plaza Square. Plantings exist between the handicap access ramp located on the front northeast corner of Plaza Square. A central air compression unit exists amongst the plantings. Front East Main Street (north) side of Plaza square: As pedestrians walk from the arched pathway on the lawn and approach the Plaza, the vortex of the pathway leads to a small rose garden and three sets of stairways. A center concrete stairway consisting of five stairs, a landing, and then six stairs leads from ground level down to the entrance of Town Chambers. Two concrete stairways, one to the right and to the left of the center stairway leads from ground up to Plaza Square. The two stairways leading up to Plaza Square contain four stairs followed by a landing, four stairs followed by a second landing, and then a final four stairs to the Plaza Square level. In addition, a handicap access ramp with a switchback turn is accessible from the library parking lot at the northeast corner of Plaza Square to the Plaza Square level. The Handicap access ramp enters Plaza Square to the left of the northeast most stairway. Left (east) side of Plaza Square: To the left of the Plaza as aforementioned, exists the Town Library parking area. Under the left side of Plaza Square exists a second entrance to Town Chambers, the entrance of which is beneath ground level. This triple stairway entrance to the underground Town Chambers and Plaza Square above Town Chambers is identical to that of the frontal triple stairway entrance in number of stairways, stairs and landings at the northern side of Plaza Square. To the right of the triple stairways (east and northeast side of Plaza), exists a switchback handicap access pathway that leads from the Library parking lot to the underground entrance of Town Chambers. Right (west) side of Plaza square: One large stairwell containing five curved concrete stairs exists between the two brick buildings – the Friends of the Library/Museum building located on the front right (northwest) corner – Friends of the Library/Museum building and Police Dispatch brick building located on the rear right (southwest) corners of the square. Beyond the Friends of the Library/Museum building exists a small municipal parking lot with an entrance off of Pageant Avenue. Behind Plaza Square: An access road with entrance from Pageant Avenue and a few parking spaces exists one story down at ground level behind Plaza Square. In addition, a generator that is on continuously and is audibly cyclically louder at times than other times was moved beneath the back edge of Plaza Square when the Town Library was built which will become a consideration for noise control during future ceremonial events. Pageant Grounds exists beyond the access road and stretches the entire width of the buildings and Plaza Square combined. It is possible that with a bridge spanning between the Plaza Square and Pageant Grounds, some of the noise could be abated, possibly with the addition of sound walls. Use: The Plaza gets very little use today other than the general pedestrian use to access the buildings adjunct to Plaza Square. The hardscape materials and lack of any overhead cover create an extremely hot area during summer months. This was not the original plan for the Plaza for cooling temperatures were previously created from the large pooling fountain no now shut off due to Board of Health requirements. A once very used Plaza serving as a centralized focal point for the Town is, as a result, very underutilized today. 1) This could become center stage for patriotic events hosted on national holidays – Memorial Day, Fourth of July, Veterans Day, as well as special Town celebrations. 2) With the addition of seating, soft scape, landscaping, some shade, and non-pooling fountains, the Plaza could become a place for gathering, relaxation and reflection for Town employees and residents. The Museums of Los Gatos organization is in the process of negotiating a lease for a potential move into the building located on the front right (northwest) corner of the Plaza. The Museums of Los Gatos center hopes to use some of the Plaza space in front of its entrance off the right (northeastern) corner for temporary outdoor small exhibits. Pageant Grounds is a tiny, almost hidden, less than half an acre historic park that backs against a hillside serving as a natural amphitheater for Civic Center. Once a focal point for Town pageants from 1919 to 1947, the Pageant Grounds stretched out to East Main Street, but with the expansion of the Town Civic Center in the 1960’s the site was reduced. The well-shaded grounds have been used in the past for special summer barbecues. Pageant Park is currently undergoing landscape renovation approved by Town Council in September 2012 to include grading the land to make the connection to the park better. It is expected to be completed by year-end per Todd Capurso, Los Gatos Parks and Public Works Director. 408-399-5774. The Park is almost the width of the buildings and Plaza Square combined which it is behind. Again, a bridge connecting the area with the Town Plaza would greatly enhance its accessibility, a reason for bringing the bridge into consideration. Today, the park offers a lovely entrance from near the Town Library Children’s Play Area, a walled handicap ramp up to the grounds, an old spring in the southeast corner of the park, a waterfall created by an open fire hydrant atop a hillside that falls into a pool of water and drain located in the back center of the park, and is being renovated to include a front hardscape area that stretches the entire width of the park and a back lawn area that also stretches the entire width of the park, altogether creating a glimpse of the past. 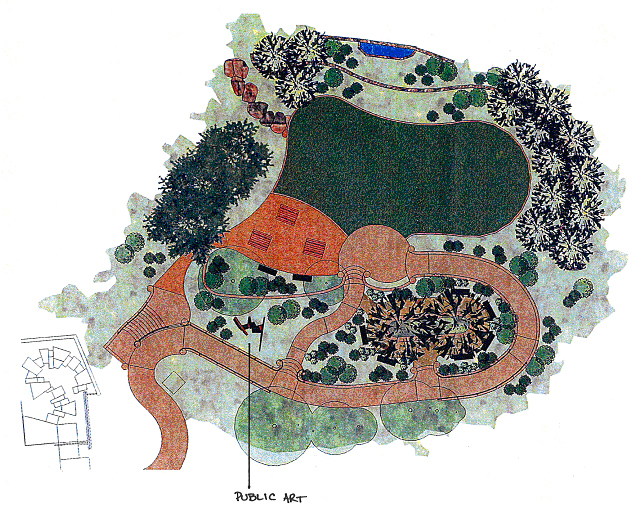 A view for the landscape-rendering plan approved by Town Council in the September 17, 2012 meeting appears below. Some changes have been made to the plan above. For one, the original plan to include a public art element no longer exists. Secondly, the front tier will be all hardscape and the back tier all lawn. A preferred view of the renovation underway in Pageant Grounds exists in the photos accompanying this document. The following is quoted from a local town website, the Los Gatos Patch “And that has town officials excited, because it means the less-than-half-acre area behind Town Hall won’t be so secluded from the public anymore. It will be the latest park built in town, and it’s sure to accentuate the $12 million library project, according to town officials. ‘When the library project was awarded to Bogard Construction of Santa Cruz, the Town Council expressed a desire to enhance the connection between the library, the civic center and the park,’ Capurso explained. ‘The overall goal is to improve an area that’s been there since the early 1900s,’ Capurso said. ‘When all is said and done, we’ll have a much better transition from the library into Pageant Grounds … the pathway that gets you from the library into Pageant Grounds will be wider, easier to use and ADA-compliant,’ Capurso noted. ‘It’s a really cozy and quiet space,’ said Los Gatos Town Manager Greg Larson. Use: Once used for pageants, other than an occasional barbeques, the park is unused at this time other than for local dog walkers. Future Use/Design Considerations: The Town anticipates that Los Gatos residents will enjoy using the Pageant Grounds in the days ahead. Imagine the serenity of being surrounded by a natural hillside like amphitheater, with the beautiful lawn and hardscape. Eventual Town Council approval of the possible bridge for which architectural drawings already exist, will improve the access immensely and add new life to this gem of a space. The bridge proposal is expected to go before the Town Council in 2013. However, this plan is under consideration and is not funded at this time. As a result, there exists no guarantee that the Plaza landing and Pageant Park spaces will become linked. The backdrop of a hillside also creates an almost amphitheater-like natural setting. · Tier 1) The Civic Center Lawn is located adjacent to East Main Street. It has the lowest elevation of these three spaces with its elevation at ground level. · Tier 2) Pedestrians walk up 12 steps to the level of the Civic Center Plaza, which represents a second elevation. · Tier 3) At the rear of the Plaza, exists a platform which is two steps higher than the remainder of the Plaza from where a bridge would emanate to cross over the access street below to Pageant Grounds. · Tier 4) Pageant Grounds located across a small access road and parking area from the Plaza. Some portions of Pageant Park are lower than the Plaza and some are higher than the Plaza. Pageant Grounds backs up to a relatively steep hillside; which spans approximately four stories in height and essentially serves as a backdrop for the entire area. The natural amphitheater – like hillside along the back of Pageant Grounds creates the fourth tier.